Following many retreats and visits to many different pilgrimage sites I felt pulled towards helping the Church ,specifically the Priests. Following a return from Walsingham,a Marian shrine near Norfolk, Mgr Kerr read out a letter at Mass asking for applications for the Permanent Diaconate. This was like confirmation to me of what I was mulling over. I then enquired and found out that it would take a total of 5 years and you had to be aged under 55 to start the course. The course involves attending 4 weekends a year and an annual summer school. The course involves writing essays 6 to 8 per year and sitting annual exams (nerve racking) even with me being a teacher, at least I can empathise with my pupils. The great benefit is the teaching of the best kept secret in the world, Catholic theology and Tradition. It was good to have lectures from the experts from Maryvale College and many Scottish experts, both Clerical and Lay people. I feel really privileged to have been ordained a Deacon and thus having received all 7 Sacraments. 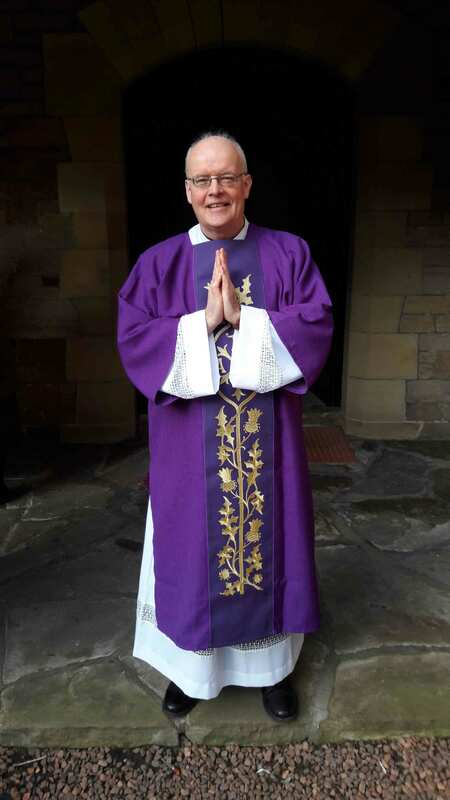 This could only happen with support of my wife Louise, Mgr Kerr, a great teacher, Sister Mary Cavanagh (spiritual director), my family and parishioners of both St.Peters and St. Columba’s (my appointed parishes). Many people ask what is a Deacon, what do they do etc. Please see below a summary of the background and role of a Deacon. It is very much needed to help the Church carry out its mission. So the Church’s teaching on the permanent Diaconate ranges from assisting on the altar to helping with certain Sacraments. These Sacraments bring the Deacon into contact with various different and diverse groups of people. In the New Testament the focus is on the caring ministry of the Church being the benevolent face to the people of God (Acts 6, 1-3). This benevolence included visiting the sick, distributing aid and helping out the less fortunate. In addition, Deacons needed to be alert to the spiritual needs of the people. This role was essentially to free up the apostles’ time to enable them to focus on prayer, Ministry of the Word, Church unity and spreading the Gospel. This is very apt today with the new evangelisation promoted by the Holy Father. In Philippians 1:1 and in several other references in early Christian literature out with the New Testament, Bishops, elders and Deacons are listed together, with Deacons listed last. Due to this hierarchy and the interpretation of the word “Diakonos”, the role of the Deacon has always been understood as being that of an assistant to Church leaders. This continues to be the target for the role of the Deacon today. The Deacon is ultimately accountable to the local Bishop. As stated in Acts 6:1-3 a complaint was made to the disciples from the Hellenists (Greek-speaking Jews) that their widows were being discriminated against by the Hebrews when alms were being distributed. This led to the establishment of the office of Deacon when the first seven men were commissioned to take charge of this alms giving. Acts 6:3 clearly states that the disciples should not neglect the word of God to serve at tables. This does not mean the Deacon’s role is to run the business of the Church but only this charitable aspect of the Church`s business. The word “business” quoted in Acts comes from the Greek word chreia and basically means “need”. Therefore there is no requirement for Deacons to be involved in the financial or other aspects of the Church`s business. This means Deacons are involved primarily in the charitable business of the Church. This brings Deacons into contact with various established groups within the Church. It does not mean that the Deacon has to take over already established, long-running charitable groups but needs to act as a link between these groups and the Clergy. 1st Timothy 3 and Acts 6 state the qualifications and characteristics necessary to become a Deacon. This clearly states the need for a spiritual dimension to the person, not just someone who handles the distribution of alms. This ensures that the person selected is not purely a good administrator but can, with his spirituality, help evangelise and spread the Gospel message. In Christifideles Laici John Paul II speaks of the Diakonia as a ministry with the Charism of the Holy Spirit from the risen Lord in uninterrupted succession from the apostles through the Sacrament of Orders. From Him they receive the authority and sacred power to serve the Church acting in persona Christi Capitas (in the person of Christ, the Head) .In Permanent Diaconate ,a book on the norms of being a deacon ,it is stated that there is a link to this spirituality of service in the same way Mary our Blessed Mother is “handmaid of the Lord” This linkage between Our Lady and the Charisms of the Holy Spirit shows that Marian and Charismatic Renewal within the Church should both involve service of God’s people. As stated in Acts 6:8-9 Stephen, the first recorded Deacon, was full of grace and power, did great wonders and showed miraculous signs. In order to achieve this there needs to be a knowledge base in order to put forward the Church`s point of view. Stephen did this in Acts 6:10 where his opponents could not match his wisdom and the Spirit with which he spoke. This again shows the importance of the spiritual aspect in the role of being a Deacon. 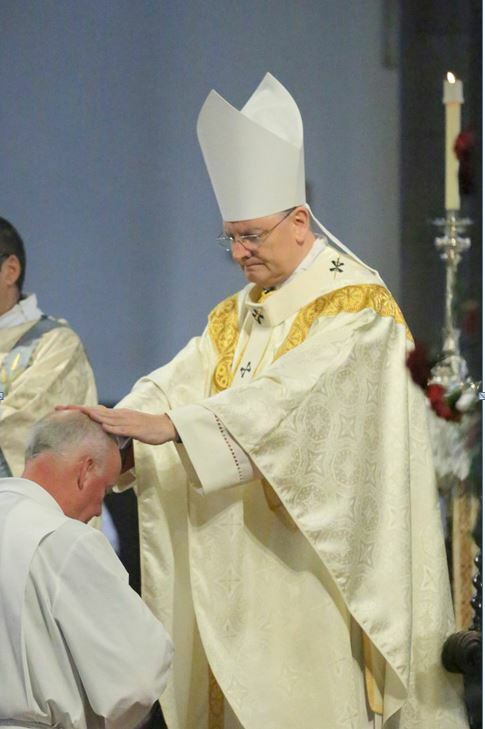 In Permanent Diaconate it is stated that the Leitmotiv of a Deacon`s spiritual life will be service and his sanctification will consist of making himself a generous and faithful servant of God .This generosity would involve time spent in adoration of the Blessed Sacrament therefore becoming a more effective member of Prayer Groups, R.C.I.A. programmes, Lenten groups, etc. This would enable others to benefit more directly from his spirituality. In the Catechism of the Catholic Church (1570 ) refers to the proclamation of the Gospel and preaching. In order to achieve this and be successful in this role there must be a strong knowledge base. In order to obtain this knowledge, there would need to be a lot of literature research and familiarity with Catholic Theology. This is achieved by a distance learning course at Maryvale college, Birmingham. When the early Apostles laid out their plans for the creation of the office of Deacon, the whole community agreed with the plan (Acts 6:5). The complaints from the Hellenists about the benevolence ministry ceased. The Hebrew-speaking Jews obviously were flexible in their approach and the men selected for the task of distributing the alms had Greek names to show the inclusive nature of the Church. This shows the importance of support from the people for the plans of the Church. Without this support, there could be constant challenging of every minor decision. 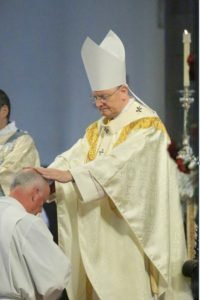 In the Permanent Diaconate, candidates for the Diaconate must be active members of a Christian community and already have exercised praiseworthy commitment to the apostolate. This should enable the Deacon to provide a clear link between the people and the formal Church. It is vital for the Church to have credible people from the community as Deacons, who fully understand the issues lay people have with balancing all the different forces in their lives while supporting God`s Holy Church. In the early centuries (2nd to 5th) Deacons were essentially agents for charity for the needy, for example widows and orphans. They were also involved in visiting the sick, prisoners and those on the fringes of the Church, including those excommunicated. They worked directly for the Bishops and must have had regular contact with them. This was in essence only the charitable role of the Deacon being fulfilled. Later on during the Middle Ages, Deacons assumed a more ecclesiastical role and it started to become a more transient position on the way to Priesthood or a mere stepping stone along the way to becoming a Priest. This was a clear break from the Biblical model of the Deacon’s role. Interestingly, during the Reformation, both Luther and Calvin proposed returning the Deacon`s role to the earlier Biblical model as documented in Acts 6 and elsewhere in the Bible (1st Timothy 3). They obviously also recognised the unique role of the Deacon within the Church. The current role developed since Vatican II within the Church has gone some way to returning to the ancient Biblical traditions with the specific tradition originating from the Council of Trent. The Permanent Diaconate states that the main driving force for this is the urgent need for missionary work to support the new evangelisation. This movement in the Permanent Diaconate since Vatican II was, ironically, also one of the targets of the Reformation.